Did you know you can make waffles without eggs? When I crave waffles, I really mean it. I just want waffles. This recipe is for those times when you get that waffle hunger, pop open your fridge, and realize you don’t have eggs for your usual waffle recipe. On those mornings, you know you need to make some waffles without eggs. And I’m here to tell you it can be done! 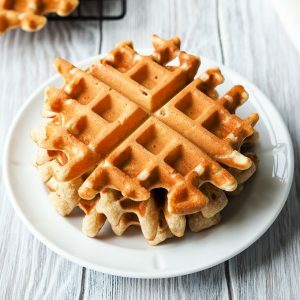 These Eggless Waffles are delicious, and to be honest, you can’t even tell they are made without eggs. Or maybe you have food sensitivities to eggs and want an egg free waffle? My toddler is in the same boat. His eczema flairs up when he consumes egg, so this is our go-to eggless waffle recipe. 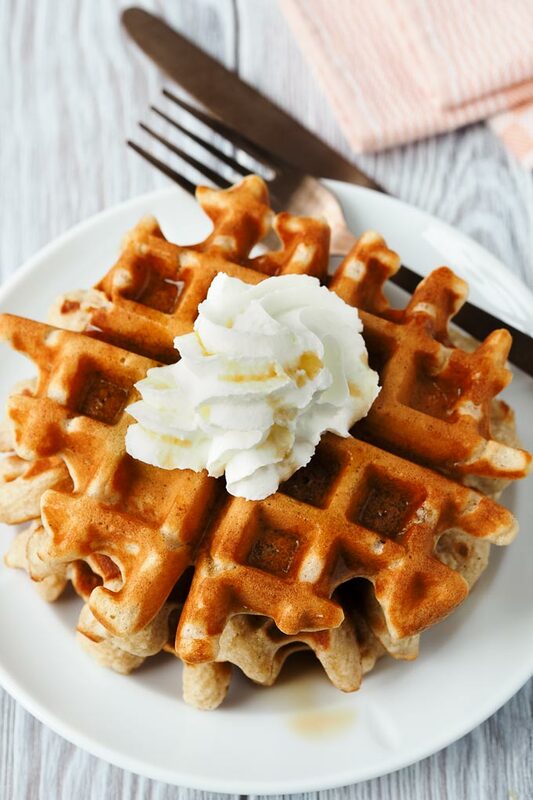 I’ve been developing some egg free recipes for him, and I’m happy to share this waffle recipe today. 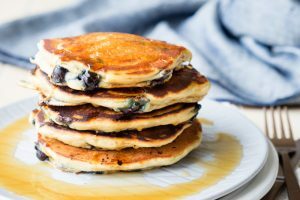 For whatever reason you are looking for a waffle recipe without eggs, you read right, you can make waffles without eggs. 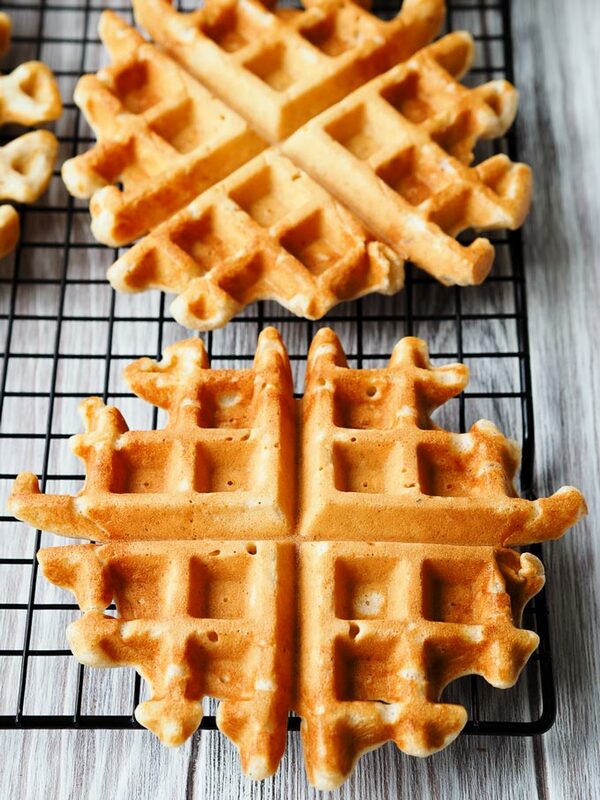 This eggless waffle recipe looks and tastes just like the best waffle recipe. While my son is allergic to eggs, my husband and I are not. So, we are people who normally eat waffles made without eggs. From our lifetime of waffle eating experiences (and trust me, I’ve eaten a lot of waffles), you really cannot tell that this waffle is an eggless waffle. My toddler, on the other hand, doesn’t know any better. But in his year of waffle-eating experience, for what it’s worth, the promise of me making these Eggless Waffles will get him out of bed, brush his teeth, wash his face and change his clothes. All without any struggle. 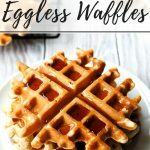 For anyone who has toddlers, you definitely know how hard that can be on a normal day, especially when there’s no promise of these Eggless Waffles! 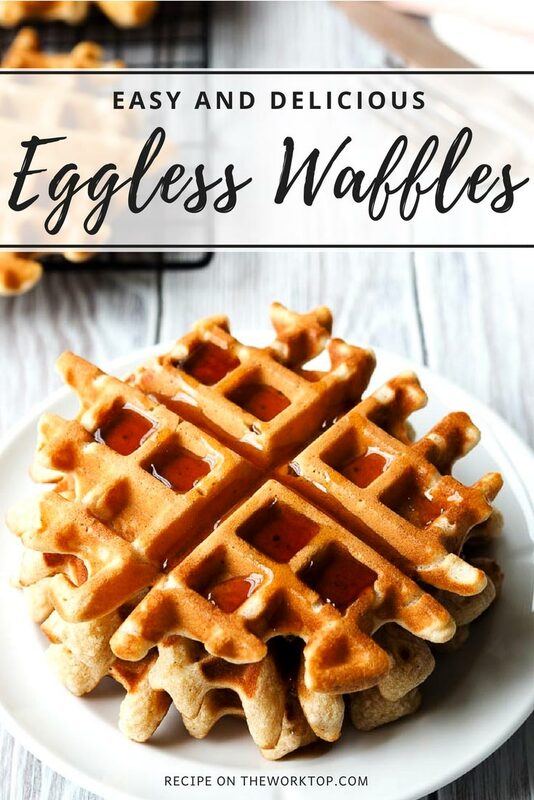 I can also promise you, this eggless waffle recipe is so easy to make, that even my toddler helps out in the kitchen. And it’s fast enough that the waffles are done before his tiny rumbling stomach turns into a meltdown. You’ll need one bowl to melt butter or coconut oil, one cup to mix milk and vinegar (for homemade buttermilk), and one bowl for dry ingredients. 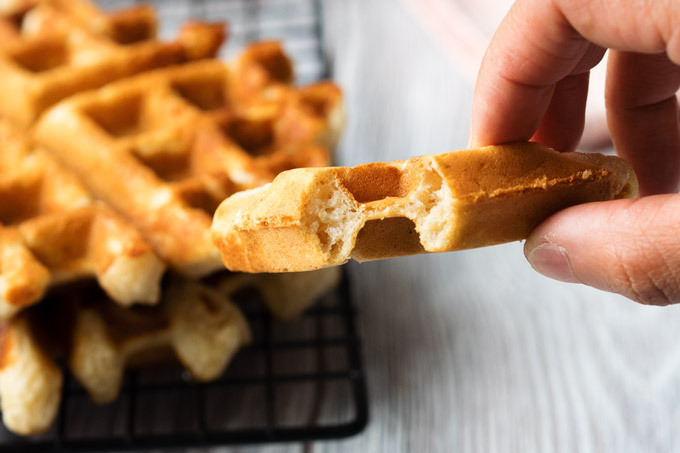 Then mix it all together, and you’re ready to start pouring this egg-free waffle batter into your waffle maker. These egg free waffles are allergy friendly. 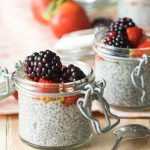 The recipe is eggless, and can be made dairy free and vegan. 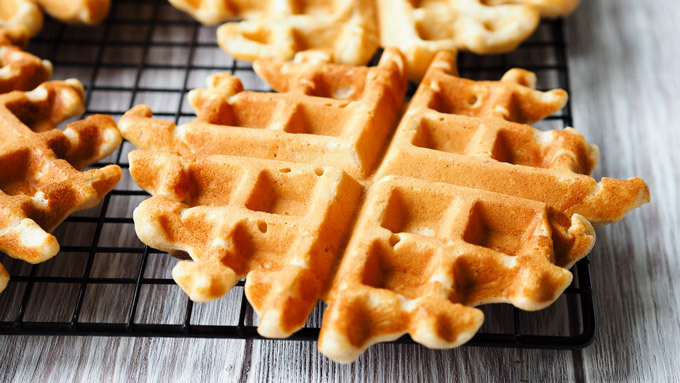 This eggless waffle recipe can be adapted to suit common food allergies. Dairy-Free waffles (vegan): You can replace the milk with a milk alternative of your choice. 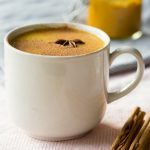 As my son is also intolerant to dairy, we often use Oatly Oat Milk in this recipe. For the butter, just swap it out for coconut oil. If you substitute the milk and butter, these waffles also become vegan-friendly. No added sugar waffles: There is no refined sugars in this egg free waffle. To take it a step further, you can leave out the maple syrup completely. 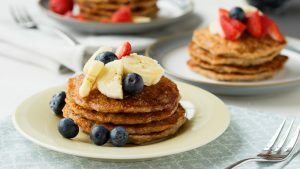 While the waffles can be described as light, the oats help provide some substance and texture with each bite. If you make the recipe with butter, you’ll get a slight buttery taste with each bite. If you make this recipe with coconut oil, you’ll get a light aromatic coconut taste. Both ways are delicious, so give them both a go. I like these egg free waffles with just a touch of maple syrup on top. My toddler likes these waffles with a dollop of peanut butter and jam. These Eggless Waffles are also really delicious with some fresh fruit and whipped cream. You can serve these Eggless Waffles with whatever topping your heart desires. But with this recipe, you know you are getting a delicious waffle with perfect texture. 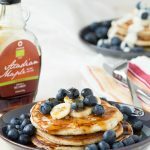 It makes for a great morning breakfast or weekend brunch for the entire family. It may be a bit unconventional, but I also love to snack on these waffles, long after breakfast has passed. 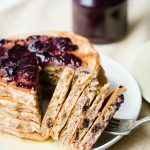 This eggless waffle recipe is healthy, especially if you make it with spelt flour (my favorite). With the spelt flour, the oats, the lack of refined sugar, they make a tasty healthy snack. 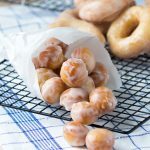 You might say, there is butter and hence fat in the recipe, but that bit of fat is also what makes this snack great because it helps keep me full. 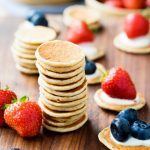 I find they are perfect finger foods for my toddler, and they pack so well in a small tupperware. Each eggless waffle triangle is great for portion control, as well as taking on the go. So if you are a small family, go ahead and make all eight waffles anyway. If you are a large family, don’t be shy and double the recipe! In a medium bowl, mix together the milk and vinegar. Allow to sit aside for about 5 minutes. In the meantime, in a small bowl, melt the butter in the microwave until it is just about melted (about 30-45 seconds). Whisk in the maple syrup while it is still warm. Mix in the vanilla. In a large bowl, mix together the flour, oats, baking powder and salt. Make a well in the dry ingredients, and slowly add in the milk mixture and the butter mixture. Whisk together until everything is mixed and the batter has come together. Pour or scoop the waffle batter into a hot waffle iron (I used a ¼ cup measuring cup for each waffle, but waffle makers vary). Cook waffles for about 4 minutes each, until cooked through. Once done, transfer the waffles to a cooling rack. I made these tonight for dinner and my family LOVED THEM! I love the texture. 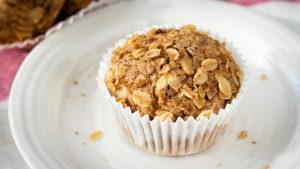 The oats really add some heft to them so you aren’t hungry in a half hour. Thank you so much! These are my new go-to. Yay! My son has an egg allergy, so this recipe is a necessity. My boys have come to expect that every Saturday is “Waffle Day”. Thanks so much for posting! Promised my daughter “upside down day” (which means breakfast for dinner) and she requested waffles. I forgot we were out of eggs. Your recipe not only saved Upside Down Day but won the waffle recipe of the year award!!! They smelled amazing as they were cooking (scent of maple syrup) and tasted even better! Loved them so much we are having them for breakfast tomorrow! I love that name — upside down day! That is so sweet, and I will have to start that in my home too. I’ve never heard it called that before. Thanks for sharing about your love for the waffles. It really cheered me up to see your comment this morning. Family said they were the best waffles I have ever made. What can I substitute for the butter? 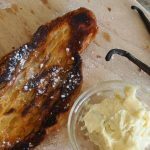 I want to make this vegan if possible – should I just use a vegan butter substitute? Or, should I use an oil , or maybe applesauce…? I’ve made it with coconut oil for the butter, and oat milk for the milk. You get a coconut oil flavor, but it’s very tasty! 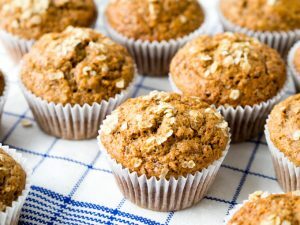 Can oats be totally skipped and replaced with all purpose flour instead? Hi Maggie, I’m sure I’ve made these without oats before and they turned out fine, but I cannot remember the substitution I did. They are really lovely with the oats though, so if you have them, I’d recommend you keep them in. 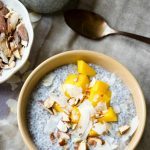 can i replace the instant oats with rolled oats? if not, are there other alternatives, or can i leave them out totally? Hi, yes you can. We do it all the time and it’s good. 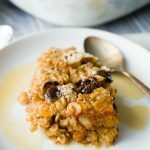 You will get a bit more texture from the oats with rolled oats. What a great recipe! 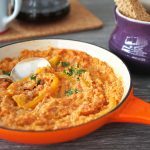 My daughter had an egg sensitivity for the first few years of her life, so this recipe would have been perfect! I will have to save this recipe for when I NEED waffles and have no eggs! Thanks!